Pervasive reliable wireless mobile connectivity for people and machine-type communications will allow companies to increase productivity, efficiency, and boost innovation in segments such as automotive, healthcare, logistics, agriculture, energy, mining, transportation, manufacturing, venues and smart cities. Starting with 4G and evolving to 5G, these wireless technologies that connect people and things, will have a disruptive impact by enabling digitalization, ease adoption of the Internet of Things (IoT), and help industry verticals leapfrog into the 4th Industrial Revolution. IoT alone has been estimated to have a total potential economic impact of $3.9 to $11.1 trillion a year by 2025. With ever increasing data rates using eMBB (enhanced mobile broadband), machine-type communications, ultra-reliable low latency and network slicing, 5G will support many new use cases including critical IoT connectivity applications. In order to make sure that the specific needs and requirements of a particular vertical industry are adequately understood and considered by the telecom industry and, likewise, the capabilities of 5G are fully realized and exploited by those vertical industries, close collaboration is required between all relevant players. With that in mind, the 5G Alliance for Connected Industries and Automation (5G-ACIA) has been established to serve as the central and global forum for addressing, and evaluating the relevant technical, regulatory, and business aspects relating to 5G for the industrial domain. Nokia is the one of the founding members of 5G-ACIA. 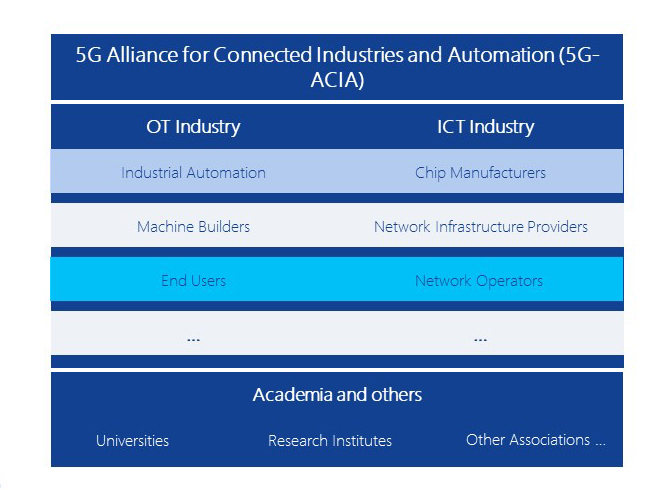 The starting point for 5G-ACIA is the recognition by the OT (operational technology) industry (industrial automation, machine builders, etc.) of the core role that 5G will play for the “Factory of the Future” and Industry 4.0. 5G-ACIA reflects the entire ecosystem with all relevant stakeholder groups comprising also the ICT Industry (chip manufacturers, network infrastructure vendors, mobile network operators,) as well as academia and others. The key objective of 5G-ACIA is to ensure the best possible applicability of 5G technology and 5G networks for connected industries, particularly the manufacturing and process industries. 5G-ACIA will ensure that the interests and peculiarities of the industrial domain are adequately considered in 5G standardization. In 2018, the priorities of the Release 16 version of 5G are discussed in 3GPP, hence this is a timely and important objective. Equally important will be to formulate views of the sector on regulation, particularly for matters related to spectrum. Further, 5G-ACIA will ensure that ongoing 5G developments are understood by and transferred to the industrial domain. Standardization and regulation are extremely important with rapid emergence of 5G as many players from the industrial domain have not been engaged in relevant telecom standardization processes in the past and vice versa. Furthermore, a common language and understanding of relevant aspects is established by uniting the ecosystem. Likewise, industry-specific requirements need to be planned, such as the possible need for dedicated certification processes etc. As with 4G, Nokia continues to drive 5G development and innovation around networks by enabling new use cases and addressing the above mentioned challenges. The industrial domain is diverse and heterogeneous,characterized by a large number of different use cases and applications with widely varying requirements. Major areas, such as discrete manufacturing, actually may differ significantly from others, such as the process industry. Not only with respect to quality-of-service requirements, but also regarding typical deployment scenarios. In general, however, all relevant application areas have in common that a new generation of industrial connectivity solutions may lead to substantial improvements and optimizations. Nokia, along with 5G-ACIA is committed to examining important aspects of different use cases that must be considered such as quality-of-service, security and safety, reliability and availability, brownfield support, backward and forward compatibility, cost-efficiency, as well as maintainability and manageability of the solutions by domain-specific personnel. For more information on how Nokia is making 5G a commercial reality, click here. Ulrich heads the Standardization activities for Nokia. He is responsible for global and regional standardization and technical regulation of spectrum as part of the Nokia Bell Labs CTO group. Ulrich is a board member of the 5G Alliance for Connected Industries and Automation (5G-ACIA), VP and Executive Committee member of the Global Mobile Supplier Association (GSA).